In the battle against desertification and hunger, soil and water are generally the most difficult factors to manage. In most drought-affected and desertified regions, soils are often sandy or stony, poor to infertile. Water is generally the limiting factor for plant growth. These tightly linked factors limit the production potential for food crops and fodder as well as improvements from afforestation or reforestation efforts. Improving soil conditions with either the use of fertilizers, manure, compost … or with the application of permaculture. Assuring the availability of sufficient quantities of water through the use of wells, drip irrigation, canals, sprinklers… or through the application of water absorbent soil conditioners, such as TerraCottem. Most often, farming and gardening are seen as an activity performed at the horizontal level – whether on a certain parcel of land or on terraces. It is the exception that farmers are thinking of growing crops in a vertical setting – in a “vertical garden“. Less dependency on soil qualities. Improved potential to optimize growing conditions. One of the earliest examples of ingenious vertical farming I encountered was performed by Prof. WANG Tao in Beijing (P.R. China). She used PVC tubes with a diameter of 6″ or 8″ (15-20 cm), standing upright nearly 2 meters high, 10” (25 cm) apart – like poles in a rack. The tubes, filled with potting soil, were perforated in a spiral with the perforations being 1-2” (2,5-5 cm) wide. In each perforation (hole in the wall of the tube) where a garlic bulb or a clove had been planted, there developed a cluster of roots in the tube’s potting soil. The new garlic plants were growing on the outside of the tubes with all new bulbs sitting quite closely to one another. Remarkably, each tube was completely covered with growing garlic plants. Irrigation was very efficient. Water was simply poured into the top of the tube and could percolate slowly through the tube – keeping the soil within the cylinder completely moistened. With a minimum of water, a maximum amount of soil was kept humid for a longer time. Evaporation was limited to the top of the tube and to each of the narrow perforations. 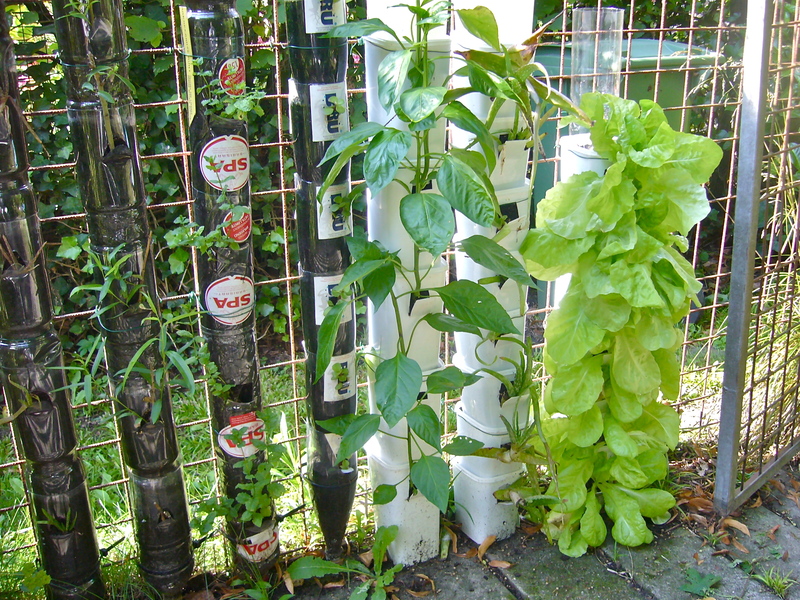 Moreover, all surplus water, running through the whole tube, was collected in a bucket at the bottom of each “tube garden”. During the percolation process, water became loaded with dissolved nutrients from the potting soil. Recycling occurred by pouring the bucket content back again into the tube. As each tube was almost fully covered with growing young garlic plants, the overall view of such a vertical garden rack of tubes was truly magnificent. Maximal plant production within the smallest surface area (footprint): e.g. several hundreds of plants on only one square meter. Significant saving of irrigation water and nutrients. Vertical farming or gardening techniques could easily be promoted by development organizations as a low investment method with a high return-on-investment (ROI). Considering that the greater majority of dryland populations cannot afford PVC tubes, I decided on a set of experiments utilizing plastic soda bottles and pots. Most developing countries are experiencing increasingly greater volumes of environmental pollution from this form of litter. By creatively recycling discarded containers, I have been successfully growing a number of different crops and saplings in individual bottles and pots, e.g. yogurt pots (see links below). 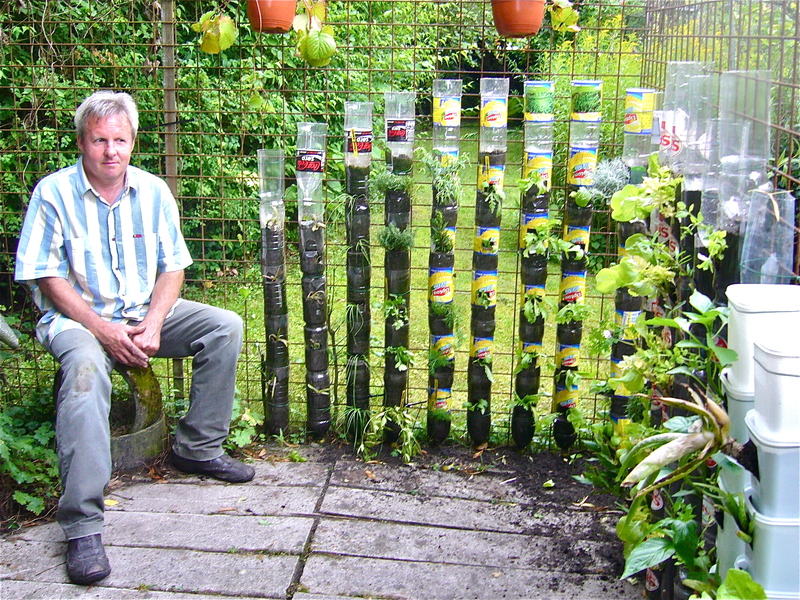 Having sufficiently demonstrated that one can easily and successfully grow a variety of food crops in individual containers, evolved the idea of stacking individual bottles or pots to form “towers”. This farming/gardening solution – growing vegetables and herbs in small “window-like openings” in the sidewall of recycled bottles and pots – has the potential of becoming a simple, but effective tool for environmentally-challenged dryland people. The process is basic, uncomplicated and easily understood. The footprint is compact with important resource conservation benefits. Watering the entire tube-like “tower” of 4-5 bottles through one single “water-tank bottle” on top of each tower offers impressive water savings and conservation. This water-saving, efficient tower arrangement offers anyone on earth the possibility of growing fresh food on an extremely limited surface, e.g. 4-5 lettuces on one single bottle tower. We strongly believe that “bottle tower farming or gardening” has a significant potential of combating hunger and malnutrition in both urban and rural areas.